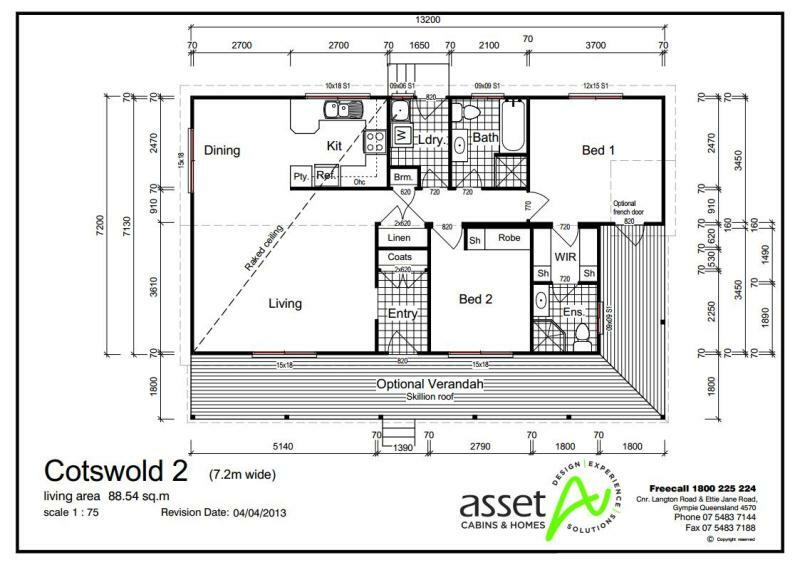 Cotswold 2 is Asset’s top-of-the-range two-bedroom premium relocatable home. It features elements of a traditional bricks and mortar dwelling, such as a central front door and entrance hallway that leads to the spacious open-plan living/dining room. The kitchen, featuring a pantry and double sink, is semi-enclosed under the raked ceiling. Along the hallway are the laundry, which includes a back door, and the full-size bathroom with a bath, shower, toilet and vanity. The master bedroom has a walk-in wardrobe that leads to an ensuite bathroom, and the second bedroom has a built-in robe. Ample storage is provided by linen and broom closets – even a coat cupboard! The building is designed to accommodate an optional skillion roof front verandah extending around one side, with an additional optional French door opening from the master bedroom. For a variation of this design, see 515 Cotswold 1.